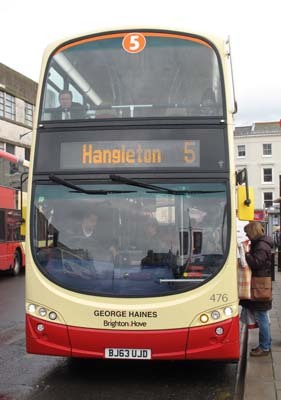 Connections with Brighton and Hove : George Haines backed bus travel in Brighton and Hove at a time when it was deeply unfashionable. The number of passengers declined each year in the Sixties and Seventies and services were reduced. "He championed bus travel but people laughed at him,"; said his son Austin. "Everyone then thought car travel the holy grail. How wrong we all were. He would be so pleased today to see his vision alive with bus lanes and frequent services." Born in Portsmouth in 1913, he had an early memory of the dockyards being attacked by a Zeppelin towards the end of the First World War. In the Second World War, he served in the Royal Artillery. His family moved to Brighton in the thirties. Mr Haines worked for many years as a carpenter and was a staunch trades unionist. Voted in as a Labour member of Brighton Council for Hollingbury ward, he was twice re-elected. With his Brighton-born wife Lil, he had five children. He died in 2004 at the age of 90. 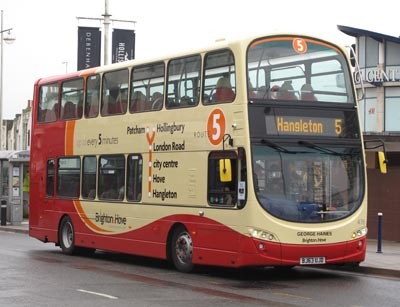 476 Volvo Gemini - carried name since delivery in November 2013 on Route 5.